Andrew Wong's second restaurant is a big, bold, beautiful space in the Bloomberg Arcade, specialising in Cantonese roasted meats and showcasing the regional flavours of China with playful, contemporary finesse. 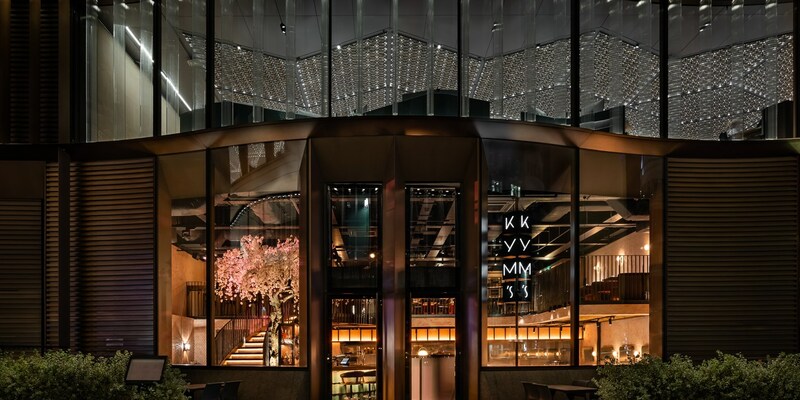 Bloomberg Arcade is home to plenty of great places to eat, but the jewel in its culinary crown has to be Kym’s – Andrew Wong’s follow-up to his renowned Michelin-starred establishment A Wong. Named after his parents’ original restaurant (where A Wong is now based), it serves a variety of Chinese dishes designed to be shared. 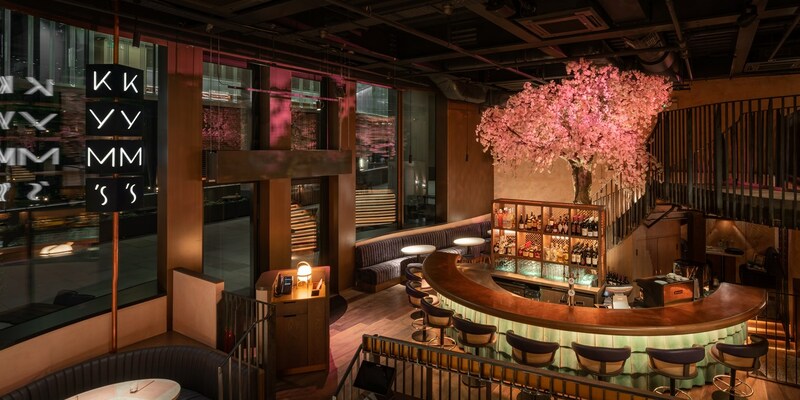 The restaurant itself is large with over 120 seats, designed around a grand full-size cherry blossom tree in the centre. Pastel pinks, moody lighting and a curved central bar show off some seriously impressive design-led credentials, but it is of course the food that is the main attraction. 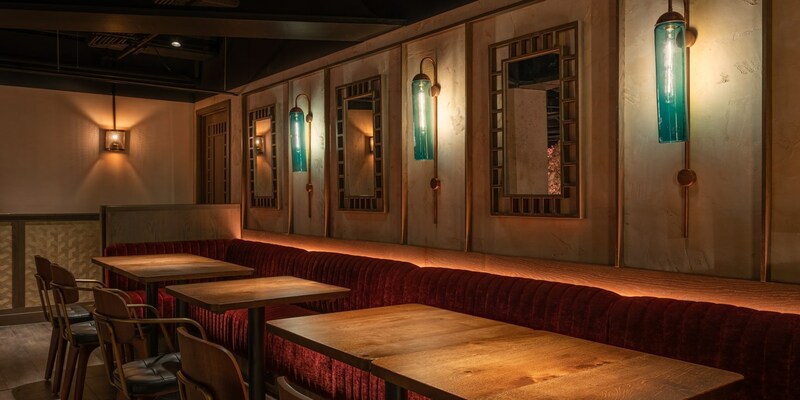 Described as ‘premium casual, all-day dining’, the menu is split into several sections, with traditionally prepared Cantonese roast meats the main focus. Soy-poached chicken, Cantonese pork belly (which takes forty-eight hours to prepare) and Iberico pork char sui are must-haves, but there are also small plates showcasing the regional differences in Chinese cuisine as well as fritters, skewers, inventive side dishes and desserts. While Kym’s is clearly a Chinese restaurant, it is above and beyond the vast majority of Chinese restaurants in the UK. Much like Andrew’s Michelin-starred restaurant, dishes are served in a contemporary, innovative style, with clear examples of the chef’s playful cooking style shining through. The pork and shrimp ‘bao bao’ sees dumplings sitting in a base of fried egg with chilli, pat chun vinegar and all manner of crispy delights, while the Chinatown pineapple bun is a fantastically indulgent dessert that’s pillow-soft and full of flavour. The drinks menu is curated to cover all bases, with a selection of Chinese-inspired cocktails (both boozy and non-alcoholic) along with plenty of beers and wines. On Sundays, Kym’s served a Chinese Sunday roast, which sees a variety of side dishes brought to the table to be shared among diners with the restaurants famous roast meats taking centre stage. Unlimited beer, wine or plum bellinis can be added for a fixed price on top. Many chefs worry about second album syndrome when opening a follow-up restaurant, especially if their first has enjoyed as much success as A Wong. Andrew, however, has exceeded all expectations, and Kym’s is quickly becoming one of London’s hottest restaurants. Restaurant images courtesy of Gavriil Papadiotis. Kym’s has a mezzanine area that can seat private parties of up to fifty people. Andrew opened Kym’s with his business partner Terry Kuet and Chris Miller of White Rabbit Fund. There are plans for Kym’s to offer takeaway dishes via a counter next to the kitchen for people wanting to taste Andrew’s food on-the-go. 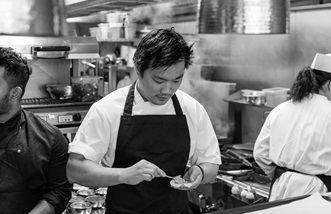 After a tour of the kitchens and restaurants of China, Andrew Wong returned to his parents' restaurant in London and transformed it into a temple of regional Chinese cuisine. He now offers diners exciting new tastes and flavours from the country, brought into a fine dining atmosphere thanks to his classical training. Growing up, Andrew Wong would have preferred to be anywhere in the world apart from his parents’ kitchen. The majority of his childhood was spent behind the scenes of the family restaurant, Kym’s, which served up the standard Cantonese fare found at the majority of Chinese restaurants across the UK. He ‘escaped’ to Oxford University after school to study chemistry, but was kicked out after a year and a half – he then enrolled at London School of Economics to study social anthropology, planning to leave the world of hospitality behind, but the death of his father meant he returned to help out his mother with the running of the restaurant. It was while working in the restaurant that Andrew realised there were huge connections between food and culture, and he began to take an interest in the traditional cuisine of China. He decided to enrol at Westminster Kingsway College to gain a grounding in cooking – taking evening classes while helping out in the restaurant and completing his studies at LSE at the same time – and started to think about the direction the restaurant could take. Instead of cooking the same old anglicised Cantonese dishes that could be found in every other Chinese restaurant, Andrew decided to do something different – and spent the next six years working on a concept for a place that would explore, educate and shed light on the regional cuisine of China.